Spring time is here and Summer is around the corner. As the weather gets hotter and as we spend more time outside. We must take extra care when being outside in the sun for long periods. 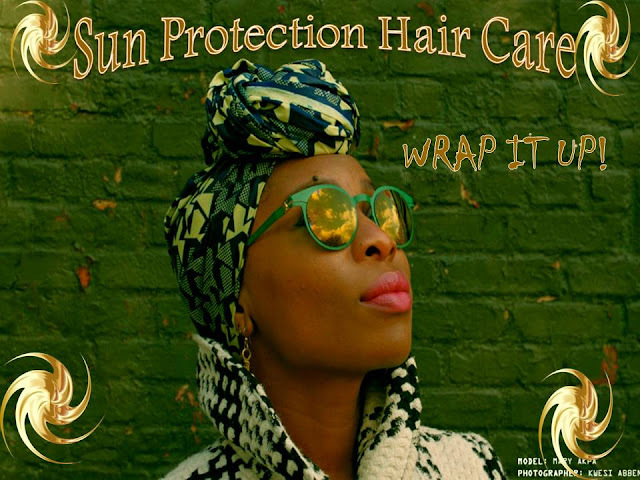 The same way we wear shades for eye protection and sunscreen for skin protection, we need products for hair protection. Mix one ounce of each oil together. Store in a dark color glass bottle. Massage oil onto scalp for ten minutes. Smooth oil completely over each hair strand. Every other day, 3 times per week. The key to a successful oil blend is using high quality oils. 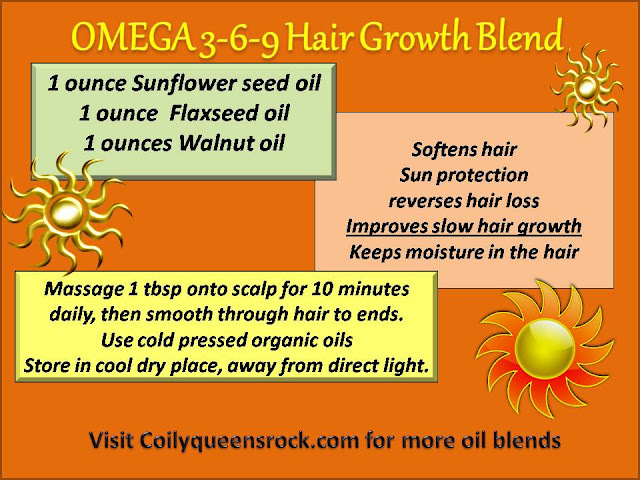 If you use cheaply made oils you will not reap the awesome benefits, your hair will just be lubricated and glossy. You want your oils to act as nourishment for the scalp and help to heal and protect your hair. Purchase cold pressed, unrefined oils. Coconut oil adds strength to the hair strands, prevents bacteria build up and is anti fungal. 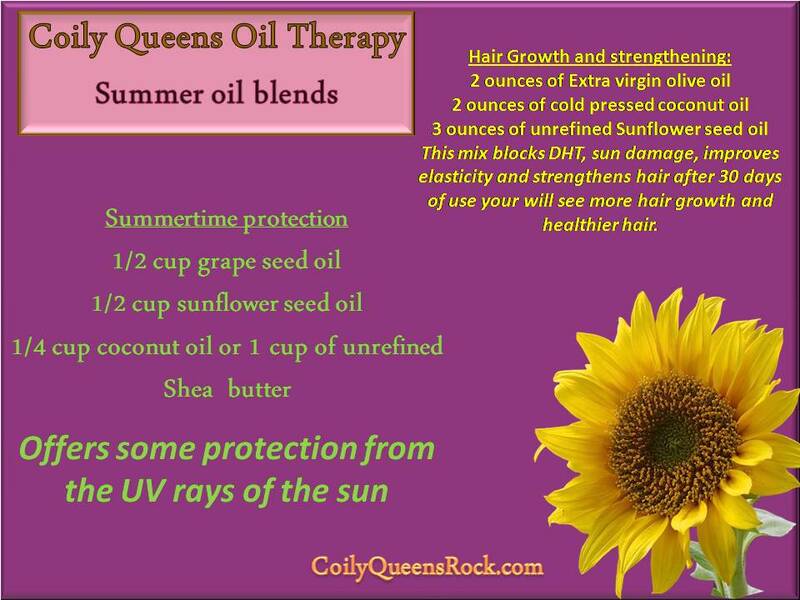 Sunflower see oil gives you sun protection. EVOO clears the overproduction of DHT on the scalp. Massage this blend onto your scalp for ten minutes then smooth oil over each hair strand. Do this every other day for awesome benefits. Sunflower oil needs to be used within 3 months of opening, so do not let your blend go rancid. Give your hair a healthy dose of vitamin D, by relaxing in the sun for ten to 20 minutes. The sun enables the body to produce vitamin D and this stimulates hair growth. Melanin thrives from the sun. Be smart wear a sunscreen and do not sit in it to long. Find a comfortable warm place to sun bathe. Black people we run from the sun and this is a problem because the sun gives us power beyond what we truly understand. Do your own research on the sun rays and black people. The research will intrigue you. Put your hair to the highest point on your head. You can do a top knot or even better a high PUFF! Finish off your shampoo spa day by allowing your hair to air dry under the warm sun. Grab you some sun tea, ice cream cone or a good book. Then sun puff it for ten to 20 minutes. I sun puff it around noon for 20 minutes daily. 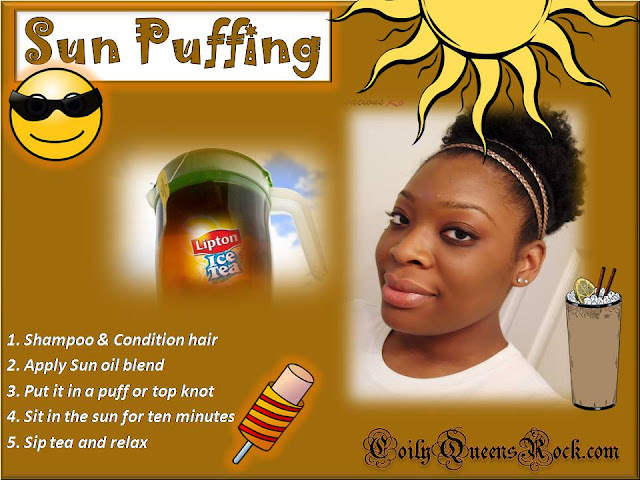 I sun puff not just for hair growth, but because I work from home and do not get out a lot. Surprisingly lots of women are low on vitamin D. The sun protects us from diabetes, cancer, depression and much more. If your energy is low, ask your doctor to check your vitamin D levels. Remember start off low and work up towards spending more time in the sun. This is how I do it, decide what is right for you. Remember that some medications you take will tell you to not be in the sun for long periods. Ten to 20 minutes is not considered a long period, just my opinion. You get more than that on a day at the beach.